An opal engagement ring is a unique yet elegant option for couples interested in an unusual gemstone with a distinctive flair. Understanding the qualities of opals and how to care for them can help couples decide if this type of unusual engagement ring is right for them. Opal is a semi precious gemstone formed from a non-crystalline silica structure. The gem is very soft and may consist of up to 30 percent water, and its unique and widely varied colors make is visually stunning and appealing to unique brides-to-be. The stone is most frequently found as a translucent white shade flecked with green and blue, though opals can be found in gray, red, orange, yellow, pink, brown, and black shades as well. The rarest opals are black and red, while whitish stones may have flecks or veins of nearly any color. The vast majority - nearly 90 percent - of the world's opals are mined in Australia. Other opal mines are found in Brazil, Mexico, and Nevada. Because of its importance to Australia, opal is that country's national gem, and it is also recognized as the October birthstone. Opal is said to represent faithfulness, confidence, and creativity, making an opal engagement ring perfect to symbolize a marriage that requires the faith of the couple, confidence in their relationship, and creativity to keep every day fresh and exciting. 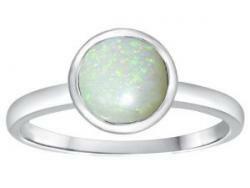 Opal is a relatively versatile gem that can be used in a variety of engagement ring designs. Because the gem is so soft and lacks a rigid crystalline structure, however, it is rarely found in faceted stone shapes; instead, cabochon or smoothly polished stones are much more common and highlight the unique colors and beauty of fine opals instead of obscuring them with light reflecting facets. The most secure design for opals is bezel settings. These fully enclosed engagement ring settings encircle the rim of the gem with a smooth band of metal, protecting it from accidental nicks, scratches, or chips. Some designs will place opals in prongs, however, and couples should be sure those prongs are secure without placing too much pressure on the gem, which could result in cracking. 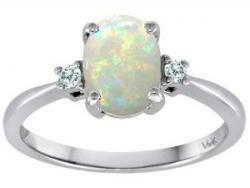 When couples are looking for an opal ring, they need to be sure they select a quality stone. The gem should be smoothly polished without scratches or nicks on its surface, and the gem's clarity should reveal the colored flecks clearly. Rounded edges are a better choice to ensure stone strength since sharp edges will nick more easily. The most important characteristic, however, is the color intensity of the stone. Stronger flecks of color with more distinctive hues are more valuable than paler, less intense shades. 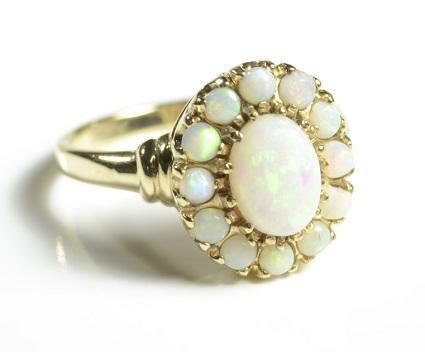 Most types of jewelers will offer a selection of opal gemstone rings, particularly in the fall when more individuals may be interested in buying their birthstone. For a larger selection with more unique and innovative designs, couples can investigate online jewelers, especially those who specialize in opal jewelry. Many times these rings will not be classified as "engagement rings" because they highlight a stone other than the classic diamond, but they can be just as lovely and meaningful for a couple to share. Because an opal is a soft gem, caring for an opal engagement ring requires more delicacy than other designs. The high amount of moisture in the ring can be dried out if it is exposed to detergents or harsh chemicals; opals should be cleaned with mild solutions only. Unlike faceted and clear gems that can become cloudy or smudged by touching, touching an opal can actually improve its luster and help it retain its moisture. Like caring for any engagement ring, opal rings should not be worn during exercise, housecleaning, or other activities that could result in damage or other engagement ring mishaps. An opal engagement ring is a lovely and unique option to symbolize a couple's enduring relationship. While the stone is more fragile than some other gemstone and diamond options, its beauty is perfect to represent the love a couple will share for years to come.